A total of six California sea lions known to frequent the lower Columbia River's Bonneville Dam in the past and feast on spring chinook salmon were trapped this week and euthanized as a part of a state plan to reduce predation on fish stocks that are protected under the Endangered Species Act. The six animals were captured as they rested aboard floating traps placed below the dam. The Tuesday removals were the first this year. The program, first approved in 2008 by NOAA Fisheries Service, has overall involved the removal of 58 California sea lions from below the dam -- 13 of which were sent to zoos and aquaria, according to the Oregon Department of Fish and Wildlife. The removal authority was requested by fish and wildlife agencies in Washington, Oregon and Idaho. California sea lions identified as having made multiple visits to the dam and having been observed preying on salmon are eligible -- added to the "list" -- for removal under criteria approved by NOAA Fisheries. The removal authority comes as an exemption to the Marine Mammal Protection Act. Five California seas lions were trapped, branded and released Wednesday. The animals did not meet criteria for removal but were branded so that that they can easily be identified in the future and their behavior at the dam and elsewhere can be assessed. Researchers at Bonneville Dam have noted that, coincident with a budding run of spring chinook salmon headed upstream, the numbers of sea lions assembled there has grown recently. "Things really picked up the past couple of weeks, as the spring chinook run began to slowly increase. At least 38 California sea lions (Zalophus californianus -- CSL) have been seen at Bonneville so far this year," according a bi-weekly research report issued Thursday by the U.S. Army Corps of Engineers. The Corps operates the dam and has since 2002 led research aimed at evaluating marine mammal predation on spawning salmon, steelhead and other species. Fish passing upstream in springtime include salmon and steelhead stocks headed for the mid and upper Columbia and Snake River basins that are protected under the Endangered Species Act. On Tuesday a total of 19 sea lions were trapped, including three Stellers and 16 California sea lions. 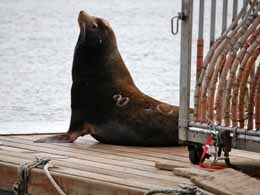 The Steller sea lions and all but the six California sea lions on the removal "list" were released. Twelve animals were trapped Wednesday. Two Stellers and five branded California sea lions were released; five unbranded California sea lions were branded and then released. There are now 54 California sea lions on the list of animals eligible for removal. Of that total as many as 20 "have not been seen for four or five years," according to the Oregon Department of Fish and Wildlife's Bryan Wright. Most of those 20 are known to have been elder animals, and have likely died of natural causes. The average life expectancy for male California sea lions is about 15 years, Wright said. The ODFW is also monitoring a group of animals, "about 15 or so" at Willamette Falls on the Willamette River in Oregon City near Portland. At least one of those California sea lions is on the Bonneville removal eligibility list. But no trapping is taking place at Willamette Falls. The sea lions, primarily males on foraging missions between breeding seasons, have over the past 10-15 years shown a considerable presence below Bonneville, where they can take advantage of milling spawners that are in search of a passage route over the dam. Historically only a few sea lions made the 146-mile trip upstream to the base of the dam, but as many as 100 California sea lions have been identified as haunting the area in recent years, likely drawn upstream at least initially by record runs early in the century. And most recently the Steller sea lion tally in springtime at Bonneville has been on the rise. Of the California sea lions seen this year, 21 have been spotted at the dam in past years. "Steller sea lion (Eumetopias jubatus - SSL) numbers have also picked up these past two weeks but are still averaging much less than the past three years," the April 17 Corps research report says. "The maximum number of SSL seen any day so far this year was 33. We have documented approximately 44 different SSL's visiting the dam so far. All but 12 of the SSL have been confirmed as seen in past years, although there are likely more new individuals." In a report issued two weeks earlier the researchers noted that only about five California sea lions had been seen at Bonneville so far in 2014, and the visits had been brief and sporadic. Steller sea lion numbers as of April 3 had picked "but are still averaging much less than the past three years." The states say that the number of salmon consumed by sea lions below the dam has declined in the past two years, but predation rates are still in the thousands. They acknowledge that it is too early to assess the long-term effectiveness of the sea lion removal efforts. The federal authorization allows wildlife managers to use lethal measures to remove sea lions that meet specific criteria, although the states' first priority has been to relocate them to zoos and aquariums. In 2014, the Oregon Department of Fish and Wildlife and partnering agencies will mark their 10th straight year in the ongoing effort to manage sea lions preying on protected Columbia River salmon runs. Estimated sturgeon catch so far this year (expanded for weekends only) "is the lowest seen since we began recording in 2006," according to the April 17 Corps research report. Steller sea lions, which are not eligible for lethal removal, have since that monitoring began, largely focused on white sturgeon that have been known to linger below and near the dam in winter and spring. "Most sturgeon taken were in the 2 to 4 foot range. "Steelhead and chinook passage began to pick up the past two weeks (9,277 chinook and 3,310 steelhead total) from January 1 through April 16. Total salmonid passage is now higher than the past three years, but about average for the past 10 years to date," the report says. "Total salmonid catch through April 16 (803 expanded by interpolating for weekends) has jumped from one of the lowest on record to about average for all the year" since research began in 2002, the report says. "This fits with the significant increase in chinook catches seen the past two weeks and the influx of many pinnipeds." As of two weeks ago, the observed salmonid catch (salmon and/or steelhead) at Bonneville was 28, including 27 taken by Stellers and one taken by California sea lions. As of April 17, Californina sea lions had been observed taking 221 salmonids, as compared to 320 taken by Stellers so far this year.